Back in Duo v17, new settings were added that allowed testers to make adjustments to some camera settings, including: Color Effects, Exposure Compensation, and White Balance. None of these were accessible to regular users, and it's not really clear that they're intended to ever reach a general audience, but it shows that the Duo team is at least experimenting with adjusting the image out of the camera. Perhaps this will be for improved video quality, special effects, or maybe even just for optimizations. With the update to v21, the list of hidden settings is getting a bit bigger. In addition to the previous batch, the Duo team has also added: Brightness, Contrast, and Saturation. There is also one other setting titled "enable video processing," which appears to enable or disable all of these effects at once. Camera brightness is currently configured to accept values between -1 and 1, defaulting to a neutral 0. Contrast can be set to as little as 0 or turned up to basically any number. The default value is set to 1, which basically means it's unmodified. And finally there's camera saturation. Like contrast, the range goes from 0 to a very large number, and the starting value is 1. Again, these settings are almost certainly not meant for regular users, but the fact that they are there is a good reason to assume some kind of video effects or camera improvements are in the works. Hopefully the Duo team shares some details at some point to let us know a little more about how these controls are being put to use. Over the last few versions, little bits and pieces were added that hinted of a new voicemail-like feature coming to Duo. Basically, instead of calling somebody and hoping that they pick up, you would be able to record a voice or video message and send it to them instead. Recipients could then listen to messages when it's convenient. In other words, this is what Duo does best, but without the real-time element. The latest update brings a bit more to the scene, including some hints about what to expect. The experience appears to be about as straightforward as the rest of Duo's interface, so it should be pretty intuitive. Users can record a message in either audio-only format or with full video, then send it to a contact of their choice. 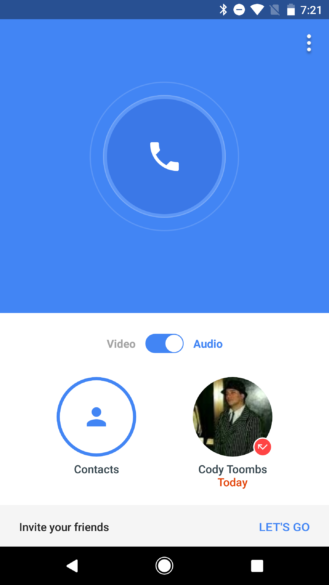 The recipient will get a notification that includes a button to immediately listen (or watch) the message. One important detail is that messages will also have an expiration date, so you won't be able to keep them around forever. There are also two lines that show if a video was successfully saved or not, but it's unclear if this is shown when a message is first recorded. It's possible these lines are meant for somebody trying to save a message they've received, though I doubt it.